Frequently asked questions include: how hot should the oil be so I avoid a greasy unappealing result? How to I prevent burning myself, or burning down my kitchen? What do I do with the oil afterwards? Use a wooden chopstick (like from a takeaway) to test if the oil is hot enough. If little bubbles form on the chopstick when you put it in the oil, it's ready to use. Be cool like a cucumber, slow an steady. Get as close to the oild as you can and slowly drop the food in. The closer you are, the less splash. Your arms and hands will thank you. Never fill your pan, deep frier or wok more than 3/4 full. Always use oil with a high smoking point. Peanut, sunflower, rapeseed, canola and safflower are good options. Unless you are planning to use a wet batter (like tempura) make sure to pat dry the food you are planning to deep fry, before it goes into the frier. It makes for crispier, tastier food with less spray from the oil. When deep frying, make sure you are using a pot or wok with a heavy bottom. This will help to stabalise your high heat and insure a better fry. Like most forms of Chinese cooking, preperation is key! 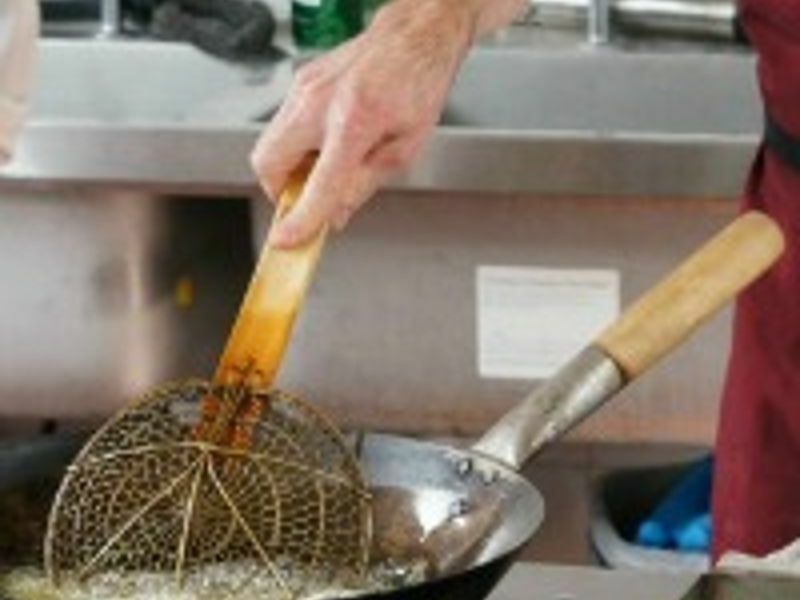 Have your long chop sticks, mesh strainers, and a large plate lined with kitchen towl ready before you start to fry, so you can easily grab your food from the wok when it's ready. When deep frying, it only takes seconds for food to go from perfectly fried to burnt or even worse- soggy and greasy! Don't over-crowd your pan! This was one of my earliest mistakes when I started cooking, and something I learned on my course that I use with all of my cooking now. Food (like people) perform their best when given a bit of space. Do a test run. If I'm making say, deep fried chicken meatballs (so good!) I like to cook just one first. I taste it, make sure it's seasoned how I would like, and then cook the rest. Nothing is worse than putting in all that effort just to have food that you don't like the taste of. Not sure what to do with your oil once you're done? If filtered properly you can reuse it for cooking or you can recycle it in small doses in your garden or for feeding birds. Thanks Jonathon for your advice! Great tips to keep in mind! Ready to have a go yourself? Check back tomorrow for our upcoming recipe for General Tso's Chicken.